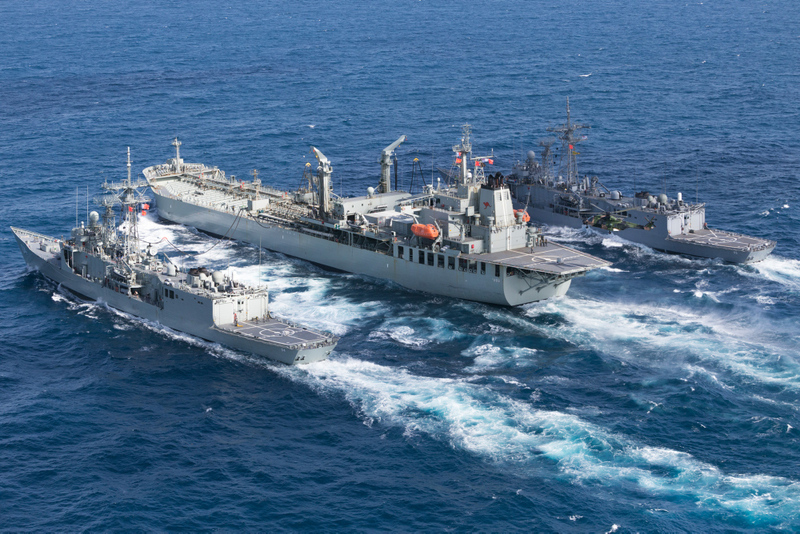 The Royal Australian Navy's afloat support capability is provided by the underway replenishment ships HMAS Sirius and HMAS Success (II). The Afloat Support Force provides operational support for the rest of the fleet by providing fuel, stores and ammunition, thus significantly extending the RAN's operational reach and endurance at sea. It can also provide limited support to deployed Army and Air Force units. 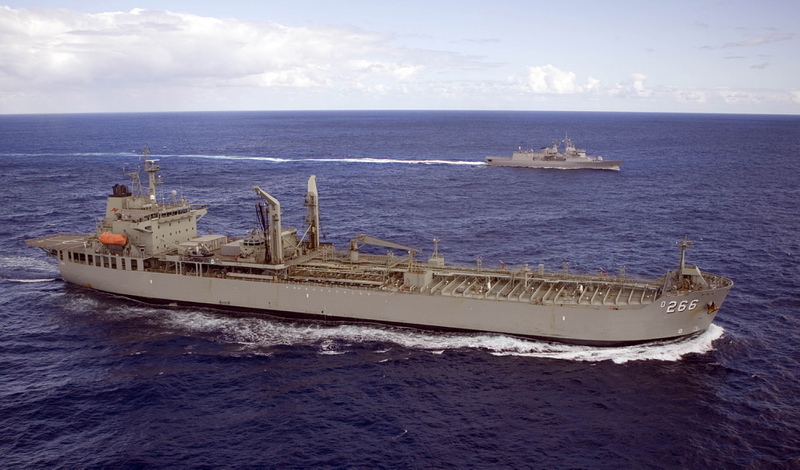 HMAS Sirius was built as a double-hulled commercial product tanker, MV Delos and purchased by the Commonwealth Government on 3 June 2004. Named Sirius, the ship underwent modification for underway replenishment. In addition, a flight deck was fitted for helicopter operations. A MRH-90 Taipan helicopter from HMAS Adelaide conducts a vertical replenishment with HMAS Sirius, as it performs a dual replenishment at sea, refuelling HMAS Darwin (left) and HMAS Melbourne (right) simultaneously. The ship can carry over 34,806 cz (cubic metres) of fuel including 5,486 cz (cubic metres) of aviation fuel for use by RAN helicopters. Sirius can replenish ships at sea by day and night, and is capable of replenishing two ships at a time. She has transfer points for fuel, water and stores. Sirius is the first RAN ship to carry this name, however HMS Sirius was commissioned into the Royal Navy in 1780 as the flagship of the 'First Fleet'. 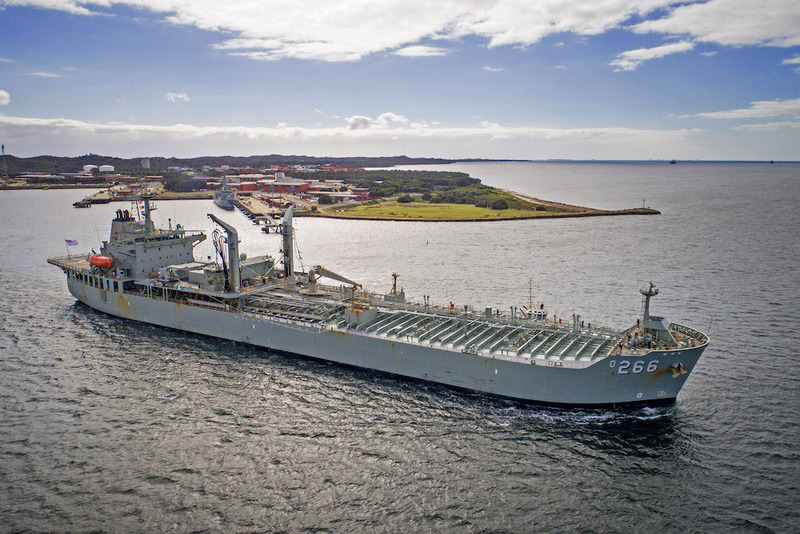 The name was selected because of its historical connections with the First Fleet and the import role the ship played in providing logistic support to the struggling economy. Her motto is "to serve and provide". HMAS Sirius departs Fleet Base West, Western Australia, for a four month deployment.